It was after seeing how useful and robust this storage drawer was that we started to look at similar products to transform the rest of his room. Whilst Tigger does like to play in his room from time to time, he does prefer to be in the playroom so that he can still be near the rest of the family. So having portable storage is must-have as well as something that is going to withstand the constant relocation etc. LEGO Storage Bricks from Red Candy were the multitasking storage solution we had been looking for. These oversized red Lego bricks come in two available sizes, and can stack just like the original mini building bricks we all know and love! These vibrant storage boxes are perfect for storing all manner of things: toys, trinkets, photographs, arts and crafts, jewellery, and, of course, LEGO bricks! Given the wide range of colours available you can opt to continue the colour scheme within the room these will be stored in or opt for contrasting colours to make them really stand out. Tigger has his eyes set upon on one of each colour. With the recent black and green 8 brick LEGO Storage Bricks first on his list with the upcoming release of LEGO Ninjago on his mind. The 8 brick style storage solution was larger than I had anticipated, however, this allowed for more items to be stored within them. Especially Tigger’s LEGO City High-Speed Passenger Train which he received for Christmas. 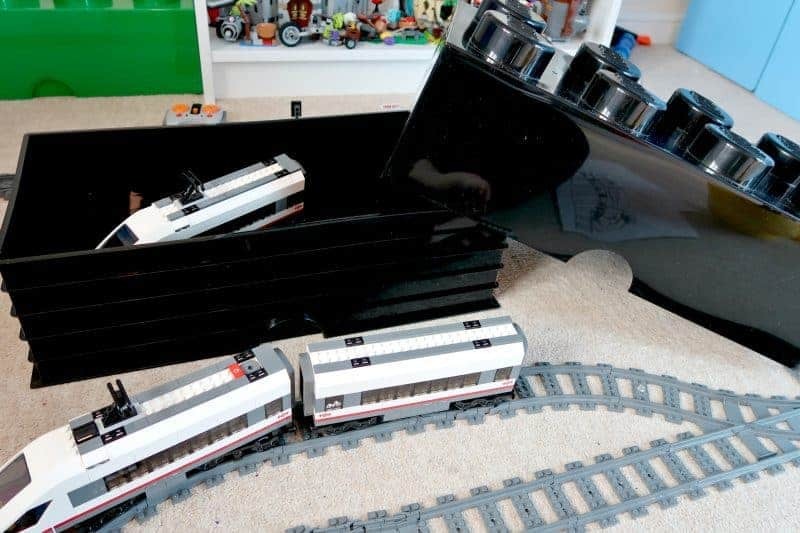 With one of the LEGO Storage Bricks the optimum size to hold the three part train and the corresponding train tracks. Enabling him to have this set up in his bedroom or playroom with ease. The stacking connections on the LEGO Storage Bricks mean that they can be utilised with almost any room in the home, as well as being used with play too. They make the perfect defence barrier against Nerf gun pellets. 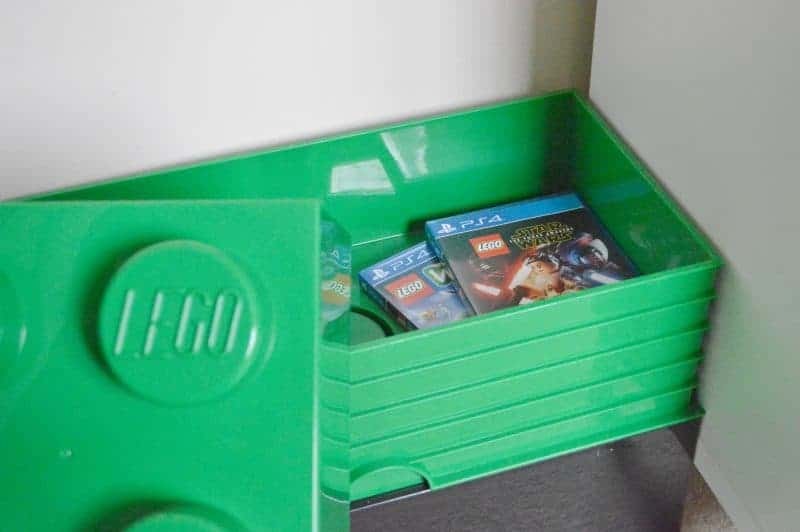 LEGO Storage Brick // Where Can I Buy? LEGO Storage Bricks are available in a variety of colour options, in either 4 brick (square) or 8 brick (rectangle) sizes. Available to buy from Red Candy with prices starting at £18.99. To help you add a little storage order into your life, Boo Roo and Tigger Too has a LEGO Storage Brick (4 brick square) to giveaway. My nephew would store Lego and other little toys in it. Lego and cars, fab giveaway! My daughter already has one of these, and it doesn’t even come close to storing the gargantuan amount of Lego bricks that she has. So another would be very welcome indeed. I would store all the little toys that seem to get everywhere, cars, balls, lego and small books. I would store all my sons lego as there is nothing worse than treading on tiny bits when waling barefoot in the front room. We would store our LEGO dimension characters in it. Probably Lego however it would depend on what my daughter (or other half) wants to store in it. We’d store Duplo in it which he got from his cousin so it doesn’t have a proper box. At least the storage box is easy to see and won’t be stood on! I would store the 1000s pieces of lego that I tread on daily! My daughters Duplo, so I at least know where it all is. this looks fab for all my son’s colouring bits that i find everywhere!!! I imagine all the little lego peices we have…. I think we could use this to store the children’s lego creations, and favorite figures. My son would keep his lego in it! This would be amazing to win for my 4 year old nephew as he loves Lego and has just had his room done up….my sister would probably store his hot wheels cars in it lol! It would be ideal for all of the small toys in the living room that stay in there to be played with together, at the moment they’re all sat on a shelf when not in play! We would store our Lego bricks in it. We bought the children the 900 brick classics boxes for Christmas so the storage brick would be perfect for that! My little boy could store his Duplo in this box. What a brilliant product! Loose Lego that doesn’t belong in sets. All the little bits of lego my Grandchildren leave lying around. We’d store my son’s actual Lego in it! It’s not terribly original but I think we’d store lego in it. Or possibly toy dogs, we seem to have a lot of those for some reason!! Toys, too many toys in the house we need a Lego house to store it all! I would give it to my Nephew, for his toys! Toy cars, LEGO & all sorts! lego! or maybe felt tips of which we seem to have hundreds! We have so much Lego as my other half likes to build models with it. I would love to put it all away in this! Def lego would be stored in ours, my little girl has just gotten into lego as well, I see the stuff everywhere! We’d store toys, books and Lego! I’d store Lego (though if I could have it for myself I would store craft stuff in it!). As much Lego as I can fit in it! Ouch! & Ouch! the Lego bricks for sure. The lego sets that my grandchildren keep at my home! A fantastic idea. I would store my sons Lego High Speed Train and all the extra track in the box. Duplo for now, Lego later! I think it would be great for the vast collection of Pokemon cards! I would store all my grandson’s little cars and animals and pieces of track as well as the Lego. My grandchildren would store their Lego in it and their mummy would be very pleased! My son would store his Nintendo DS and games in it. I would use it to store the tiny toys that so often get lost. I have some of these and they are fantastic! My daughter has just got into Lego friends. So those sets need storage! Craft materials, pens and paper. I’d store my kids toys, that seem to always seem to be lying all over the house! My Evan would store Lego in it. Drawing paper pencils crayons etc. It would be used to store Lego, of course! My son has lots of little vehicles so he’d probably store those in there. My sons ever growing lego collection! Would be fab to win for my daughter her collection is starting to grow now. I would give this to my nephew for him to store all his toys and various building sets. Definitely lego, my son would love one of these. I would use it to store all my daughters Barbie dolls. My little niece would keep her Lego & other small fiddly bits in there! Like her little Peppa Pig figures that are usually on the floor ready to be stepped on! All of our many many lego kits! This would be the perfect size for my son to store his lego ps3 games in so im not forever tripping over them.